It's not Sonam Kapoor's Birthday today..! It's just that this post has been due for long, and what better than to do it today..! 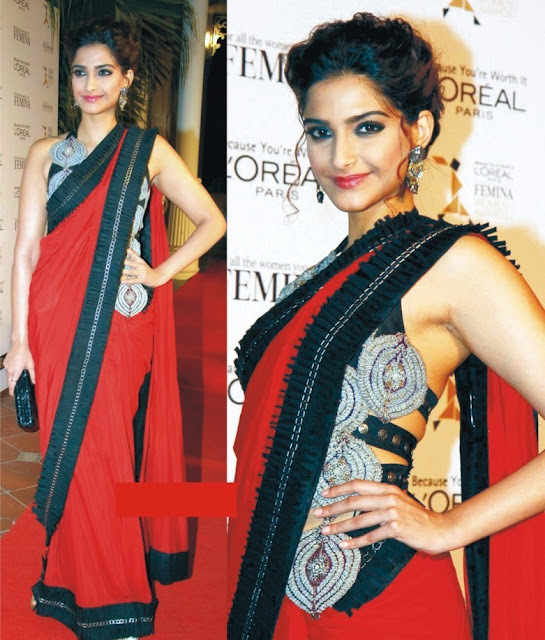 Sonam Kapoor.. Bollywood actress, daughter of actor Anil Kapoor, the face of Loreal, but more so a Fashionista. I admit I haven't seen much of her movies, but I also confess my ardent love for her fashion sense. If I have to choose my favourite fashionista..She's The Girl..!!! If you have been following my Facebook page, [Yes, So-Saree does have a presence on FB too, so you better like it..! ;)] you wouldn't miss my love and admiration for this Style Diva. 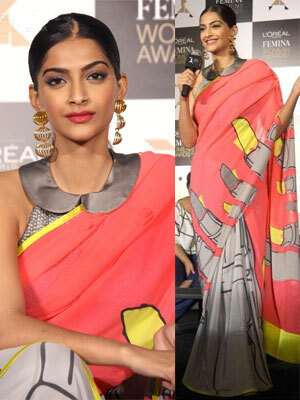 When in So-Saree's very first post, I mentioned that Saree is finally getting it's due thanks to the new crop of designers and their muses..believe me..I was thinking about Sonam Kapoor. There's something about this girl that you just can't miss. She can carry off any look with equal elegance. And she has never once disappointed me at the Cannes..she is just bang on..all the time. So, if you are too busy to follow fashion trends and fashion weeks, don't be sad, coz if you follow her style..you have acquainted yourself to the latest trends across the globe, with tips on how to make those looks work, as well. Just scroll down and see for yourself. 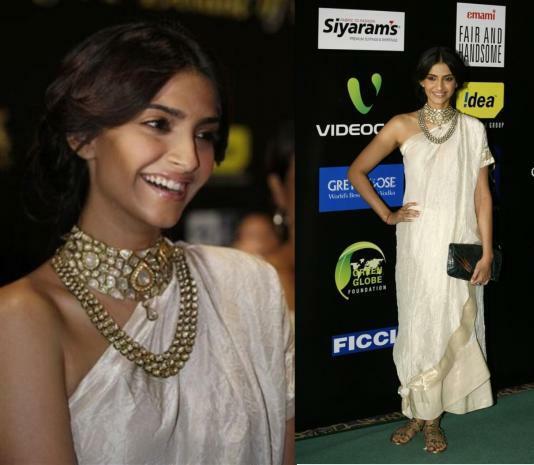 wow.. so many looks that i havent seen b4.. Sonam is truly a fashionista! So true Shubhi..only Sonam can carry that off. I never liked Sonam Kapoor before... BUT after this post... YOU have changed my opinion about her. I absolutely love her! 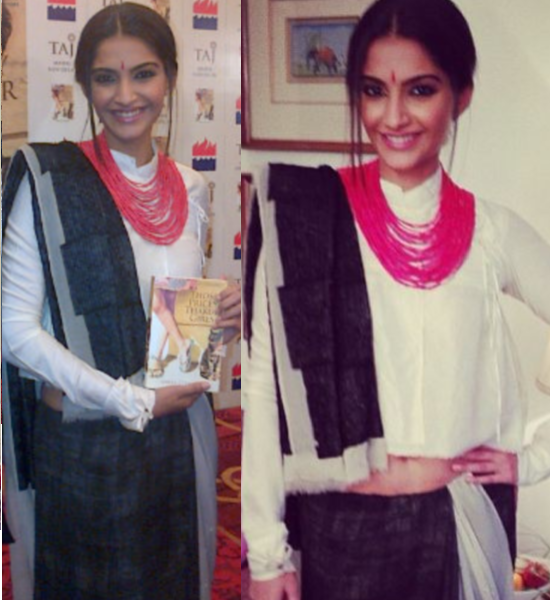 She's best dressed Indian woman..and is a great style inspiration to us! Her movie Aisha was rocking in terms of style and labels! I am so glad you did this post! I love all the sarees. I wonder from where do you dig all this. Good work girl! Thank u sweetheart..u know..i have to..m not as photogenic as U. Thanks Pearl..i love ur blog. 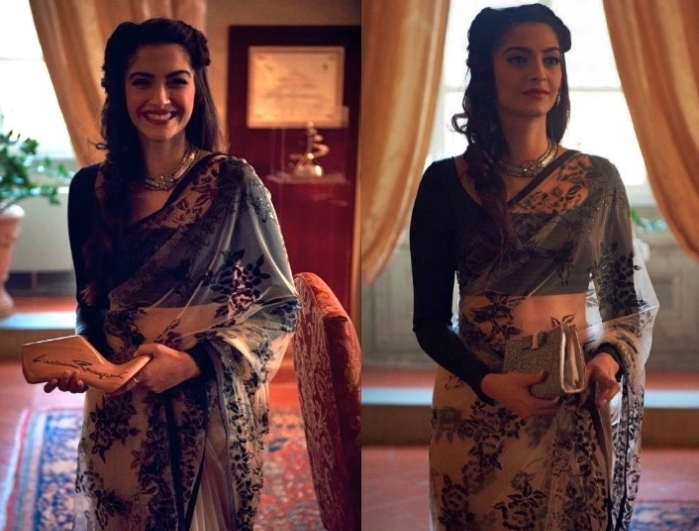 she has an exquisite sense of style..the way she works prints!and look at the make-up and accessories with each saree..it is all so perfect! i am sure going to like your fb page! Thanks Debbie..u r too sweet. Hi dear!! This is a really great post!! You know any other actor you can just look at them once and you know what they are wearing. Sonam pays so much attention to the details. I love her sense of style. She just does something else with the clothes,accessories and makeup.